Below, you will find answers to some of the more common questions people ask me. If you can’t find the answer you’re looking for, please post your question in the comments of this page or visit my Facebook page. 1. How do I pronounce my last name? Like ricochet. But if you ask my husband, my kids, or my brother-in-law and his family, they pronounce it: Dee Nick O chay uh. Why the difference? Our whole clan pronounced it the same (the first way), until my brother-in-law backpacked through Europe. By chance, he met some Basques in Spain and learned, not only do we American DeNecochea’s spell it wrong, we say it wrong too. He promptly decided to start pronouncing his last name according the original Basque style. My husband followed suit. And then my kids. And then my brother-in-law started a family. And now his wife and their kids all use the original pronunciation. I tried the original pronunciation for a while. If it meant enough for my husband to change it, then I could too, right? Wrong. After a few embarrassing introduction encounters, the worst culminating in shaking my son’s new teacher’s hand and saying, “Hi, my name is Rachelle … uhhhh,” awkward head tilt as I searched the air for the right way to say my own name, then, in mid-sentence, decide changing my last name twice was excessive especially since I’ve only been married once, to the same man, for nineteen years, I reverted back to, De Nick O Shay. I haven’t tried to pronounce it the wrong way since. I’ll leave it to you. Say my last name which ever way, I’ll answer to either one. Extra bonus points for getting Rachelle right on the first try (Ruh Shell). 2. How do I get my ideas? Gatekeeper: Becca’s story came from a concept. I wanted to write about a teenage girl finding her identity and learning to excel despite fear. So, Becca was born. The rest comes from asking questions. What is Becca scared of? Who are her friends? What would make Becca face what she’s most afraid of? The answers to those questions wrote the story. 3. How much of my life inspired the book? Caper Acres remains my favorite park. I still hold deep love for the crooked barn. 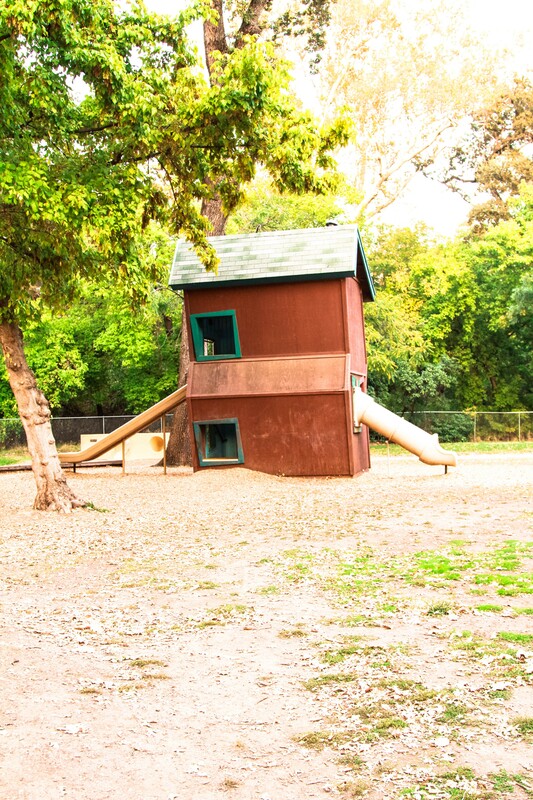 I used to spend hours running up those wood plank stairs then sliding down the bumpy slide. I loved that thing. 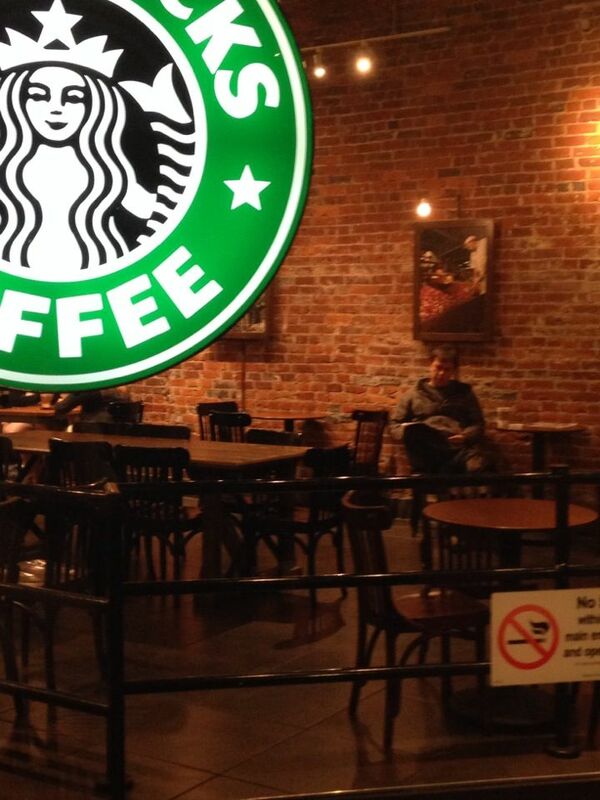 In the opening scene, Becca and Gwyne sit outside Starbucks in downtown Chico. My dad and I often met for coffee there. I remember gazing across the street one afternoon thinking this would be the perfect place for something spooky to happen. 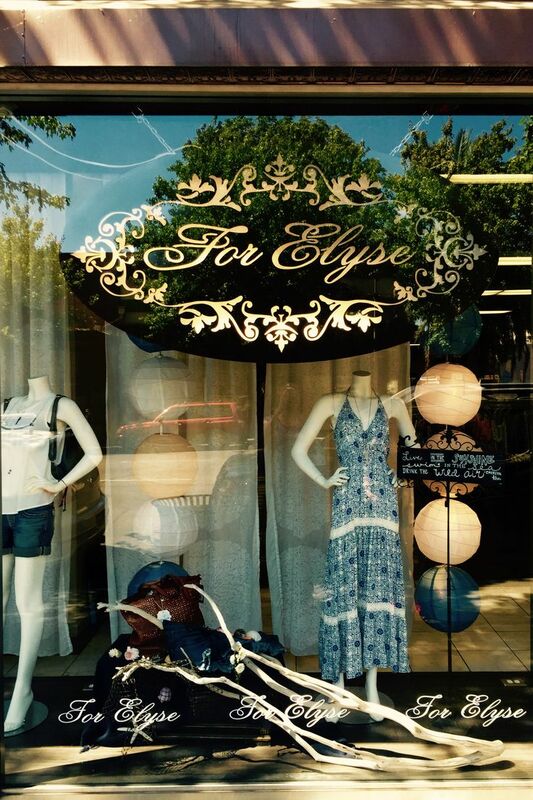 Gwynevere’s Closet is a play on a downtown store called “For Elyse” named after the owner’s daughter. The site is all wrong though. If you tried to follow Becca and Gwyne’s footsteps you’d run into St. Augustine’s Episcopal Church. Jesus Center is a real shelter in Chico. I used to serve dinner there, thus Gwyne’s passion for helping others and volunteering at the shelter. 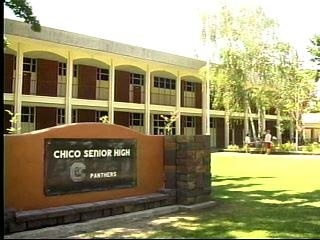 Chico High may be the location of Becca’s school, but the layout is modeled after Oak Ridge High, my alma mater. If you ever visit Chico High, you will find no creek running through the middle of campus. 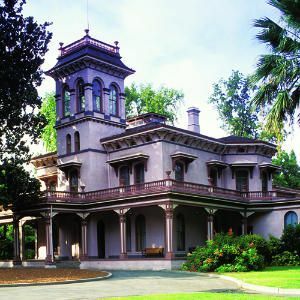 I used to take field trips to Bidwell Mansion in grade school. I love it. The old furniture, John Bidwell’s eerie painting, all the ghosts begging for a story of their own. 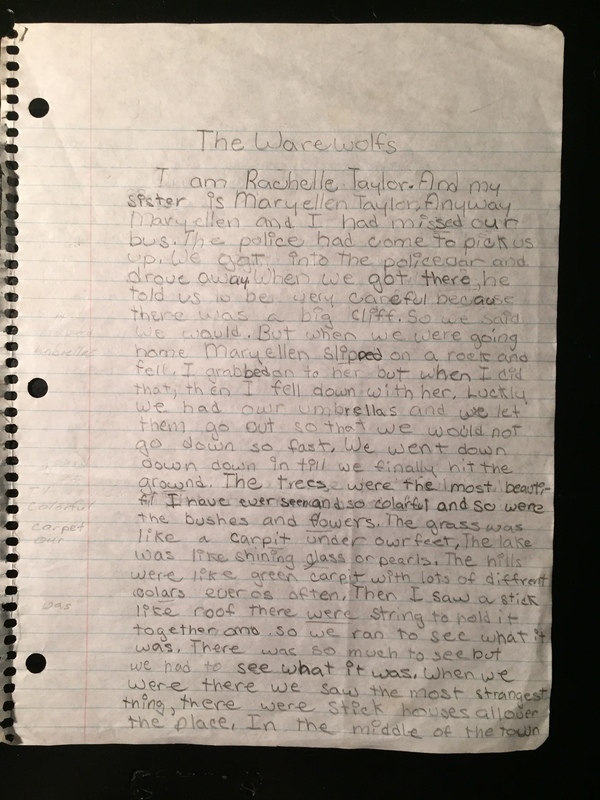 Becca Grayburn: During my childhood I experienced a ton of supernatural phenomena and it petrified me, just like Becca. Her feelings are extracted from my process of healing from the terror. Like me, I wanted Becca to grow through fear and come out a confident warrior. Gabe DiAngello: I hate secrets. I believe honesty and consideration can eradicate most disagreements and hurts. Of course, this wouldn’t make for a great novel… I put some of my husband in Gabe too–the protector, the deep feeler, the overall hero. None of the events are real, though I must admit my worst fear as a teenager was waking up to find evil eyes staring at me from the foot of my bed. I wasn’t fond of mirrors either. 4. 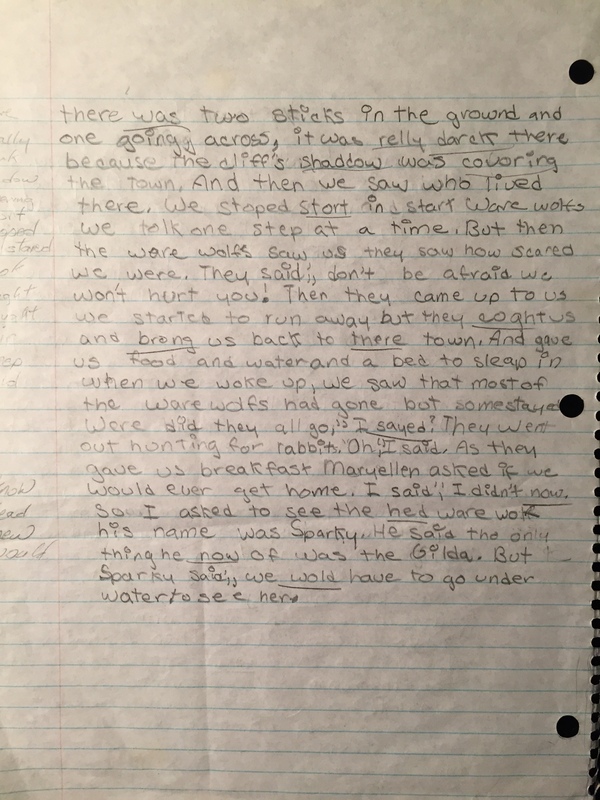 What was my favorite scene to write? What was the hardest? 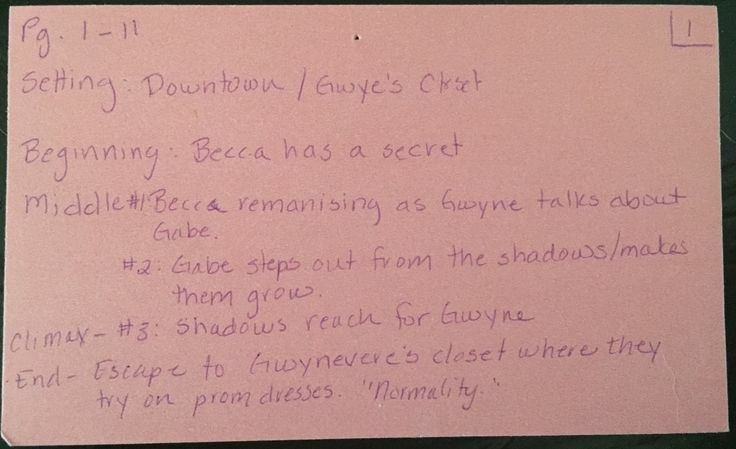 Favorite: The scene where Owen brings Becca the note (Gwyne wrote) and she crumbles from humiliation. I kept imagining social worst case scenarios and put them all in that scene. Hardest: The first scene and the climax, on these scenes a novel fails or succeeds. I agonized over every detail for weeks and weeks. Although, the dream sequence with Sachee might be a close second. I knew what I needed from her story before I created her. But as I wrote, I grew to love Sachee and hated her fate. 5. Where did the Ugly Ones come from? What’s their story? They come from Orendria, of course. A different book will tell that story. Be patient. 6. What is my writing process? My writing process is a work in progress. With each new writing book I read, each new blog I follow, each new revelation in the middle of my writing day, I tweak my process. Writing is a craft, one not easily mastered, and from what I understand even the pros keep learning. On this page you’ll find the ten writing steps I used to create Gatekeeper, along with helpful tools I’ve gleaned from other writers and ones I’ve developed during the decade I’ve pecked away on my keyboard. Below I’ve included my top-four story plotting influences. For character development, do a google search for “character development worksheets” and pick your favorite out of the hundreds available. Larry’s blog and his book, Story Engineering, helped me move from stuck amateur to novelist. I created The 9 Milestones of Story Structure Worksheet based on Larry’s story principles and added a few milestones of my own. Randy’s Snowflake method of designing a novel proves just as helpful as Larry’s milestones, but his process looks much different. Randy’s book, How to Write a Novel Using the Snowflake Method, starring Goldilocks as she attends a writer’s conference, made me laugh and educated me all at the same time. Truly a valuable investment. His e-zine, focused on organizing your writing, creating your story, and marketing you work, has become something I look forward to every month. Jim wrote a book recently, Super Structure: The Key to Unleashing the Power of Story. He includes a few pivotal scenes I hadn’t come across before. Look for his myriad of short, fun, and practical writing books. I met Susanne at a my first writer’s conference. We hit it off and, through a few content edits, she has pushed me, tugged me, and encouraged me to grow as a writer. Over the years, her blog, Live. Write. Thrive., has been an invaluable learning tool. After completing The 9 Milestones of Story Structure Worksheet, I plan the 60 scenes that add up to a novel. 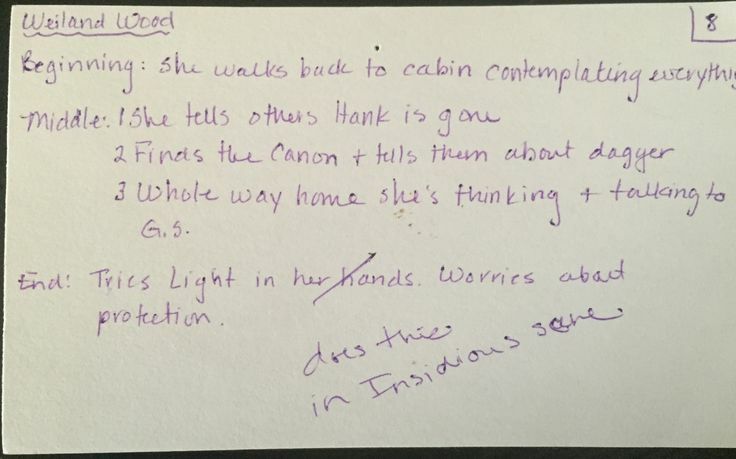 A white note card with a short summary represents each scene. 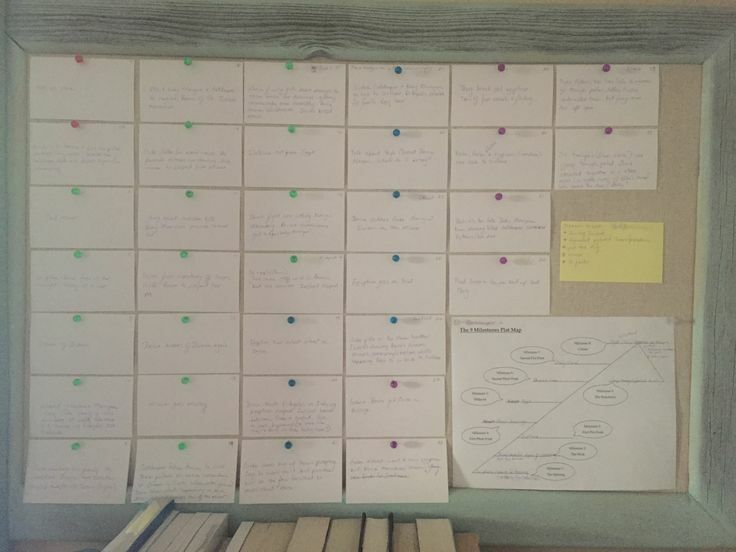 I use physical note cards posted on bulletin boards and the cork board in Scrivener. This way, even if I’m not at home, I have my outline. The bulletin board above my writing desk. 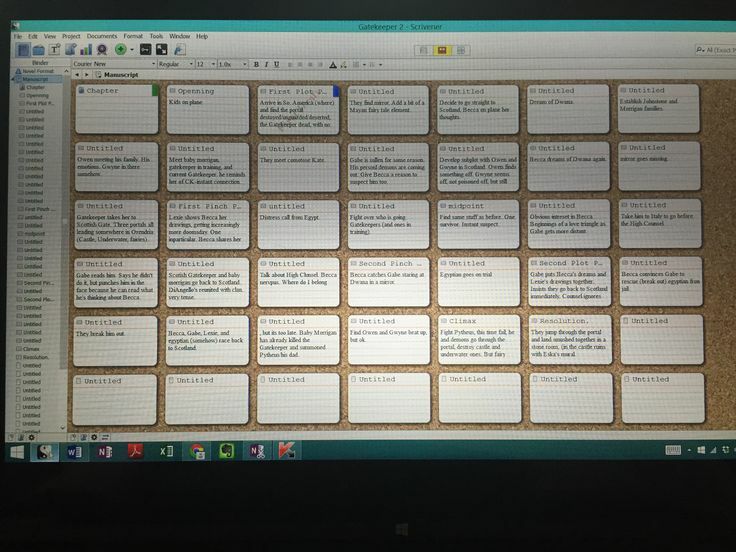 My Scrivener cork board view. After outlining the scenes, I write and write and write until I complete my first draft. I never stop for spelling or grammar mistakes and often skip dialogue or chunks of scenes I can’t visualize yet, knowing I’ll fix it all later. When creativity leads, it shows me hidden subplots and symbols that make the story so much richer. After finishing a scene, I change the color of the note card. This might seem like extra work, but it serves two purposes. It gives me a visual gauge of where I am in the book and, as a list person, gives me the satisfaction of checking something off my list. I use a different color for each part: Pink–Part 1, Green–first half of Part 2, Blue–second half of Part 2, Purple–Part 3. The final read through is a two-step process. The first step consists of tweaking everything that makes me cringe, even if I only flinch a little. Every word must make me proud and reflect my best effort. In the second step, I read the entire manuscript out loud. Unfortunately, I still miss typos and grammatical errors, which is why beta readers and freelance editors are a MUST. I’m lucky enough to know a few teenage girls in my target group. They have encouraged me, asked great questions, and helped fill holes in the plot I didn’t realize I left out. What a gift! Enter the freelance editor. These grammar gurus clean and polish and make the manuscript shine. Last Step: Query Agents . . . Send one in comments or use any of the social media sites listed in the sidebar. I’d love to hear from you! Very interesting to know about the conflict in pronunciation (and the spelling too, I guess? ), but I think your name is how you spell it and tell it! I also liked your idea of bulletin board posts to help organise the story!